Though the weather here in Florida is nearing its “rainy” season, there’s still plenty of sunshine to get outside and get our grill on. That may conjure up images of sizzling steaks and burgers over hot coals, but for those looking for something a little different, try this. Look inside your fridge and pull out your favorite, delectable and naturally sweet treats: fruit. I’ve always loved fruit and truly try to incorporate a variety into my diet each and every day. But at times the same cut up apple with yogurt or the same cottage cheese with strawberries can get a little dull. So I decided to explore a bit by cranking up the heat and adding a little flame to those brightly colored edibles. Fruits like apples, pears, plums and pineapples are great grilling fruits as they hold up to heat longer and can keep their shape. Softer fruits like peaches, mangoes, strawberries and kiwi can still be grilled, but don’t need as much time to cook as they can turn mushy quite quickly. Larger pieces, like pineapple rings or halved peaches, can be placed directly on the grilled. Smaller chunks can be placed in a row on a skewer or grilled on a grill pan. Grilling fruit with an added splash of sweetness like honey or agave nectar can create a delectable dessert option. Leave the skins on for such fruits as apples, plums and pears to allow them to hold their shape better during grilling. Below are a couple recipes I tried, as well as links to some others for you to go forth and explore. I hope these spark some imagination and give you a new avenue to enjoy the fresh, natural sweets that the grilling season has to offer. Turn on grill to medium-high heat. Arrange fruit, alternating varieties, onto skewers; the amounts depending on how large your skewers are. Lightly baste each skewer with maple syrup and set it onto the grill. Let cook on each side for about five minutes, or until grill marks appear on the fruit. Remove from grill and serve. 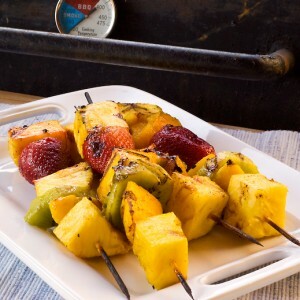 Fruit grilled on a skewer can be a great side dish to a savory meal. Even though this one uses the sweet of maple syrup, I served it alongside a grilled chicken salad and it paired beautifully. *Note: I say to leave strawberries whole because when I attempted it, I halved mine. This caused them to cook very quickly and become almost too mushy. That said, the flavor was still very sweet, juicy and had my taste buds singing. Turn on grill to medium-high heat. Take peeled and cored pineapple and cut it crosswise into 1-inch slices. This should yield 4-5 slices. Plate slices and, with the agave nectar and a basting brush, take them to the grill. Baste one side of each slice generously with the nectar. Put the basted side down on the grill rack, and let cook for 5 minutes. While the basted side is cooking, brush the side of the pineapple that’s facing up with nectar. After 5 minutes, or when grill marks are visual on the pineapple, flip each slice over and cook again for 5 minutes or until grill marks are present. Remove pineapple from the grill. Plate one to two slices on a plate. Place one generous scoop of ice cream on top of the pineapple, drizzle with agave nectar and sprinkle with ground cinnamon. Serve and enjoy.